The Pesticide Action Week, an annual campaign taking place between March 20 and 30, has just entered its 14th edition. Over these ten days, at the very start of spring, the French organization “Generations Futures” musters up citizens, organizations and institutional stakeholders to tackle the issue of chemical pesticides and warn against the threats to health and environment resulting from the use of these substances. 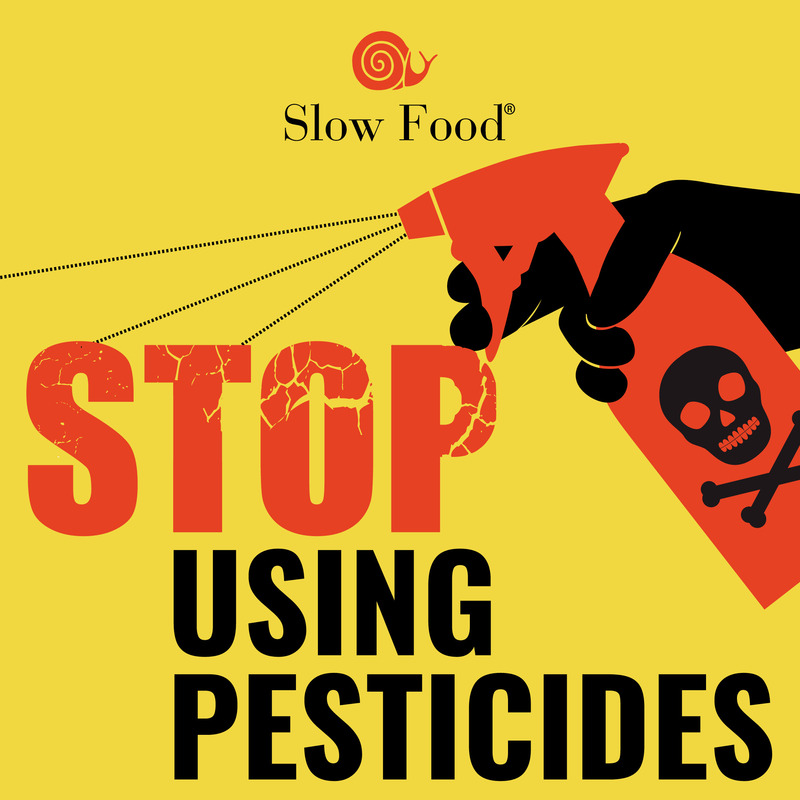 The purpose of this week of activism is to highlight alternative actions to avoid the use of chemical pesticides, throughout information events and campaigns seeing the participation of big and small organizations, and Slow Food is one of them. We are dealing with a huge and worldwide problem, having to do with each one of us, as we are breathing, eating and moving people…in brief: as we are living. This is not just a farmers’ or experts’ problem, but it concerns every living creature. For instance, traces of glyphosate (the key ingredient of Roundup herbicide, to be clear) were found in a high number of processed food, as it was recently confirmed in a study by the CALPIRG Education Fund. This is just one of many research projects that have come up with the same results: traces of this chemical permeate virtually anything we eat or drink. And there is more, glyphosate infects our body too, claims Portuguese organization GM-Free Coalition, that proved the presence of glyphosate in a group of Portuguese volunteers. A recurrent exposure to the herbicide and a widespread contamination due to glyphosate were both confirmed by the tests. One of the arguments used by Monsanto and pesticide producers is the lack of alternatives to the use of these substances to ensure food security – a suffcient availability of food to feed the whole world population. But we know for sure that hunger and malnutrition are not linked to productive quantity (largely higher than the real needs) but rather to serious malfunctions in the purchasing power distribution and food distribution systems. Both are driven to make profits for big corporation and not aimed at fulfilling everybody’s needs. Speaking of production systems, for example, organic agriculture is a methodology using purely natural chemicals, where appropriate. In this regard, it is also worth mentioning agroecology, which Slow Food has been promoting for a while as a valid agricultural model, since its basic idea is to implement a set of common key principles for every farming system – a way to design and adjust these systems to the existing frameworks. A model whose targets do not just involve production, but also take into account the social equity and environmental sustainability features of the very system. Again, in terms of productivity, the Independent Institution for Sustainable Development and International Relations (IDDRI) published its “Ten Years for Agroecology” research, showing that a transition to a kind of agriculture that is free from synthetic chemistry is absolutely realistic. The TYFA (Ten Years for Agroecology) scenario focuses on European Countries and is based on the phase-out of pesticides and synthetic fertilizers, the reconversion of pastures into biodiverse environments, and a larger use of agroecological items (hedges, trees, ponds, stony grounds, habitats). Another important concept is represented by a widespread dissemination of healthier diets containing less animal-based foods and more plant-based ones. If we take the 2010 data as a reference, this scenario, despite a 35% production decrease (expressed in kcal), totally meets the needs of the European food sector, maintaing the same export capacity for items like cereals, wine and dairies. This system also helps reduce greenhouse gases emission (GHG) by 40% in the whole farming field, restore biodiversity and protect natural resources (soil life, water quality, and more complex trophic chains). With regards to the poorest countries, 286 agroecology projects that were applied in 57 African and South-East Asian countries, covering 37 million hectares of land overall, provided outcomes that cannot be ignored: the yield doubled, the environmental impact was lower as well as higher employment rates and an improved quality of life (de Shutter, 2010). It is clear then, that agrochemical corporations, first of all Monsanto, are implementing strategies to prevent a transition to a pesticide-free farming system (which would cause staggering economic losses for them) and thwart freedom of information on this topic. So much that the European Court of Justice stepped out to intervene, ordering EFSA (European Food Safety Authority) to publish any possible study on cancer risk from exposure to glyphosate, following the charges pressed by four Green Party Euro MPs. In fact, EFSA had previously classified glyphosate as a non-carcinogenic substance (whereas the International Agency for Research on Cancer had classified it as “likely carcinogenic to humans”) on the basis of unpublished studies and a report that simply copied and pasted some analysis from a Monsanto’s study, whose pages included extracts from an application submitted by Monsanto on behalf of the Glyphosate Task Force (GTF), a consortium of companies led by the Bayer-owned corporation. The judgment expressed by the Court of Justice is certainly good news, but the whole story stresses the fact that the highest-level representatives of the institutions and public authorities overseeing citizens’ health are under enormous pressure. This is why we do not have to let down our guard and must join the action with the Pesticide Action Week anywhere and anytime. Find out about all the events here.